One thing to say right from the start, Danny Schmidt is a superb songwriter; a songwriter’s songwriter if you like, practised in the alchemy of creating gold from, well, algebra, statistics and string theory for a start. Unlikely base metals maybe, but Danny Schmidt’s no ordinary singer-songwriter; he’s a poet, a physicist and a metaphysicist. Keith Richards might claim that you just have to pull songs out of the air, but Danny Schmidt is proof that great songs can be honed and crafted till they shimmer if you have the insight, the inspiration and the skill. 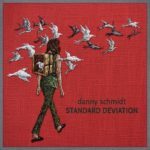 Danny Schmidt’s songs cover a wide range of subjects and styles; he’s convincing with the wordy, technical songs (the album’s title track, for instance) and also has complete mastery of the personal, confessional style that tops and tails “Standard Deviation”. The album has wonderful examples of both of those styles; the title track combines a slightly unconventional love story with an interest in various modern scientific concepts. Also, and Danny doesn’t labour this in the lyrics, he highlights the differences between the relationship between the statistical concept of the normal distribution and the day-to-day us of the word ‘normal’. The lyrical beauty of the song is enhanced by a gorgeous arrangement building up to the entrance of the celestial choir towards the end of the piece. The song that tops the album, “Wait Til They See You” is exactly the kind of song that a doting father writes about his miraculous and beautiful baby daughter while the closer, “We Need Another Word” asks a serious question about whether the word ‘miscarriage’ is appropriate as a description of a harrowing personal ordeal faced my millions of women every year. I think he has a point. “Bones of Emotion” is an exploration of the of the turbulent undercurrents of a family gathering at Christmas, while “Newport ‘65” is a deceptively straightforward look at Dylan’s move away from conventional acoustic folk, which highlights the dangers of being seen as a prophet – acolytes crave certainty and react badly when that certainty is taken away. “Standard Deviation” is a great example of the songwriter’s art; songs covering a wide variety of styles and topics set in arrangements that make them sparkle and shine. The album is released in the UK on Friday March 29th on Live Once Records (LOR CD 10) and Danny will be touring the UK in May.